CA Sales Tax: All deliveries to California will be charged 8.0% sales tax at checkout time. Christmas Ornaments, ceramic 3 inch diameter, with gold cord for hanging. Price includes shipping & handling to lower 48 states only. 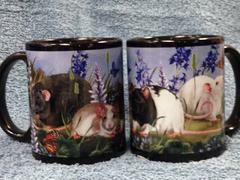 Rat mugs! All 4 beautiful images are on each mug! Price includes shipping and handling to lower 48 states only. Guinea pig mugs! Choice of breeds on the front; backgrounds vary.